Ephraim is located in Sanpete County north of Manti on US 89 near Manti-La Sal National Forest and Sevier Bridge Reservoir. 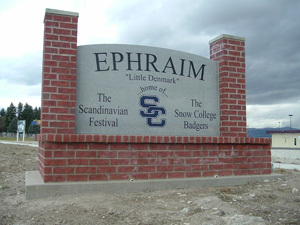 Ephraim gets its name from one of the tribes of Isreal mentioned in the Old Testament. It was founded in the spring of 1854. The population estimate for July 1, 1998 was 4,486, an increase of 1,123 since 1990.